Hi! I am selling for my in-laws a teak wood table lamp in the Danish or mid-century modern style popular in the 1950s and 1960s. This one was purchased originally in the 1960s (so one owner only) but it has been in storage for the last twenty years or so. It is in excellent working order and the incandescent bulb shown in the photos is included in the sale. There is no shade. 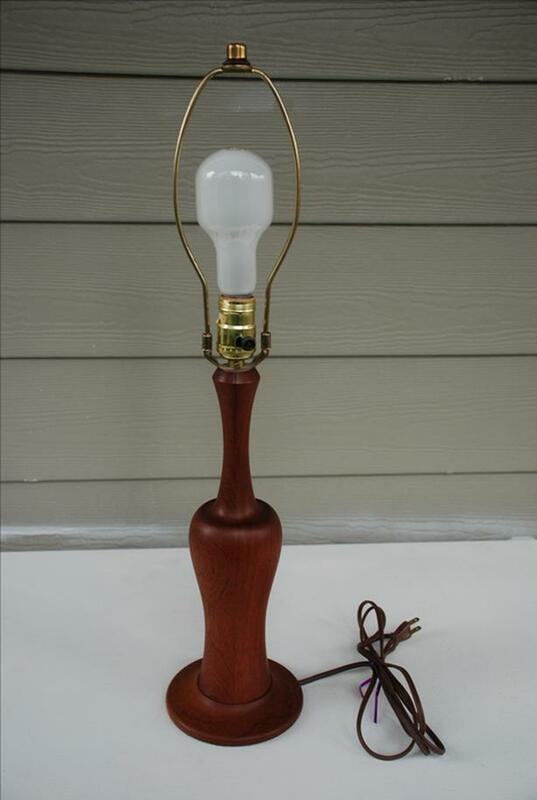 The lamp measures 5.5"L x 5.5"W x 24.75"H: the wooden base alone is 14"H. The electric cord is 6' long. I am asking $125 for this lamp. I am located in Vancouver, BC but shipping is no problem. I will be happy to mail this vintage lamp to you using CanadaPost and Interac bank transfer. So, if you are interested in purchasing, e-mail me and we'll figure out the logistics and/or I can answer any questions you may have. Thanks!